Spread 1 1/2 tablespoon peanut butter or reduced to fat cream cheese on each tortilla, leaving 1-inch of clean space at the top edge of each tortilla. Layer spinach leaves on top of peanut butter. 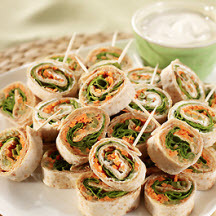 Place 3 celery sticks across the middle on top of the spinach; sprinkle with shredded carrot. Keeping the clean edge at the top, roll tortillas up tightly from the bottom, folding in the sides after the first roll. Wrap each burrito tightly in plastic wrap and refrigerate for at least 30 minutes Remove plastic wrap. Cut each roll into 1/2-inch slices, inserting a toothpick into the burrito before each cut is made. Serve with yogurt or ranch dressing for dipping. Recipe courtesy of "Food for Thought: From Parents to Children" - a cookbook created from the collaboration of the Wheat Foods Council, Chef Gale Gand and parents around the country. By purchasing the book for $3.50, you can support Spoons Across America, a not-for-profit organization dedicated to educating children, teachers and families about the benefits of healthy eating. The 35 nutritious and flavorful wheat-based recipes found within the book are fun to make and will help teach children about nutritious food choices. Cookbooks are available at www.wheatfoods.org. If you have any questions, contact wfc@wheatfoods.org. Nutritional Information Per Serving (1/4 of recipe; 1 tortilla roll-up, unsliced): Calories: 351; Total Fat: 19g; Saturated Fat: 4g; Cholesterol: 1mg; Total Carbs: 37g; Fiber: 7g; Protein: 15g; Sodium: 686mg. Recipe and photograph courtesy of Wheat Foods Council.